Barbare Comstock (R-VA), seen above during a House committee hearing on combatting sexual harassment in Congress this past December, held a similar hearing this morning on harassment within the science world. House congressional members conducted a hearing Tuesday morning on sexual harassment and misconduct within the scientific world. Alongside testimony offered by experts in the field on how to improve the reporting process and better protect victims, there was also a clear request by the government: Let us know when universities aren’t being honest about their suspected predators. 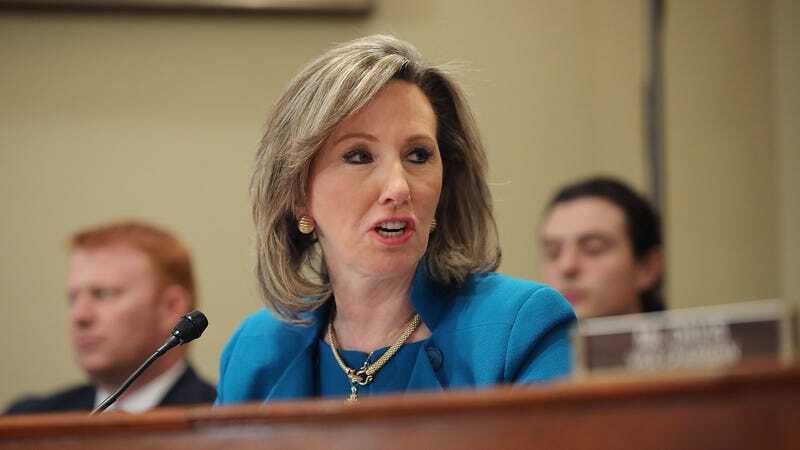 The hearing was held by the Subcommittee on Research and Technology, chaired by Virginia representative Barbara Comstock. Since the advent of the #Metoo movement, Comstock has—perhaps unlikely—emerged as one of the leading voices within Congress demanding reform. Earlier this December, she also led a House committee hearing on combatting sexual harassment in Congress. Rhonda Davis, head of the National Science Foundation’s Office of Diversity and Inclusion, began the hearing by highlighting the NSF’s recent decision to set up a portal on its website where students and faculty members can directly report claims of sexual misconduct to the NSF. The hope is that the database will put pressure on NSF-funded universities to report harassment committed by its scientists. Earlier this February, the NSF issued a notice to the presidents of NSF Grantee organizations mandating this sort of reporting and threatening to cut funding to institutions that don’t comply. The NSF, according to Davis, is responsible for about a quarter of all basic research funding to universities. Davis also said the agency will help universities find replacements for senior scientists investigated for sexual misconduct, as a way to keep cases from jeopardizing the careers of victims who are often junior scientists under the thumb of their harasser, as well as potential witnesses who are fearful their testimony will cause them to lose their jobs. Christine McEntee, executive director of the American Geological Union, called for the establishment of universal standards regarding sexual misconduct; better training that emphasizes ways bystanders can step in to help; a more transparent reporting process that protects victims from being retaliated against; and reforms that center how universities and labs can positively improve their environments rather than simply punish harassers. She also cited the AGU’s recent policy to classify sexual harassment as a form of scientific misconduct, one that she hopes other scientific organizations and agencies will adopt. “This is going to take a community effort. We can’t allow fear of backlash to stop us from trying to address and create the kind of positive work environment we need for science,” McEntee said. Both Kate Clancy, an anthropologist who has spent the past several years documenting the extent of harassment within the lab and on field research sites, and Kristina Larsen, a former university administrator and attorney who has represented clients in the STEM field and academia who have been sexually violated, noted that there’s still a disconnect in what we consider to be actionable offenses. Clancy in particular noted the recent case of David Marchant, a Boston University geologist, who was accused by his former graduate student Jane Willenbring of repeatedly harassing her both sexually and physically during several research expeditions to Antarctica from 1998 to 2000. Last year, Boston University concluded in its investigation that Marchant had sexually harassed and demeaned Willenbring but did not affirm her allegations that Marchant pelted her with stones, blew volcanic ash in her face, and even pushed her down a rocky slope during the expeditions. Marchant has continued to deny all of Willenbring’s allegations. Marchant was mentioned later by Barry Loudermilk (R-GA), a member of the broader Committee on Science, Space, and Technology. Loudermilk, citing obtained emails between Boston University and the NSF, asked Davis why the NSF had at first told the university that it was not allowed to force them to replace Marchant as project leader. In response, the university declined to remove him from the position. It was only two months later that the NSF reversed its stance and told the university that it should remove Marchant. Davis responded that the Marchant case was “uncharted territory” for the NSF and highlighted gaps in communication between different branches of the NSF—gaps the agency is now trying to plug. She stated that every sexual harassment case reported to the NSF now will be coordinated with her office. She also affirmed the NSF’s goal to be more proactive in documenting cases, disclosing that the agency was made aware of an university placing a faculty member on administrative leave pending an investigation just this past Thursday. Within two hours, Davis said, her office had assembled a team to look into the matter and updated its database with information about the case. Last Thursday was also the day that Buzzfeed News published its investigative article detailing a decade-long history of sexual misconduct claims alleged against Lawrence Krauss, a theoretical physicist at Arizona State University. The university has since said in a statement that it is investigating the matter, but did not announce any administrative actions taken against him. Other scientific organizations have since begun to blacklist Krauss from their events. Sun Devils Against Sexual Assault, an survivor-activist organization at Arizona State University, did however start a Change.org petition yesterday, pressuring the university to fire Krauss. The NSF did not immediately respond to a request for comment regarding the details of the case Davis referenced. ASU has not commented regarding whether any action has been taken against Krauss. More important than anything else, Clancy often repeated, is a need for universities and scientists, especially those in power, to examine and change the broader culture surrounding science. “It’s like we think rudeness and cruelty are the same thing as being smart, without noticing that we direct these cruelties more at women than men, more at women of color than white women, more at sexual minorities than straight folk,” she said.